A little more than a year ago, autonomous trucking startup TuSimple —flush with a fresh round of venture capital — was preparing to scale up its testing to two full truck fleets in China and the U.S.
TuSimple, a China-backed company with an R&D facility in San Diego and test operations in Tucson, has put that money to use. The startup, which launched in 2015, is taking three to five fully autonomous trips per day for customers on three different routes in Arizona, TuSimple said Monday at CES 2019 in Las Vegas. All of these trips have two safety engineers, one who is behind the wheel, and another monitoring the data pouring in during each trip. That’s a milestone for TuSimple and the burgeoning autonomous trucking industry, which is getting increasingly crowded. TuSimple isn’t disclosing its customers. The company did say it has 12 contracted customers. TuSimple isn’t slowing down either. The startup plans to expand from the 11 autonomous trucks it has operating in the U.S. today to 40 by June. An additional route from Arizona to Texas will come online in early 2019, the company said. 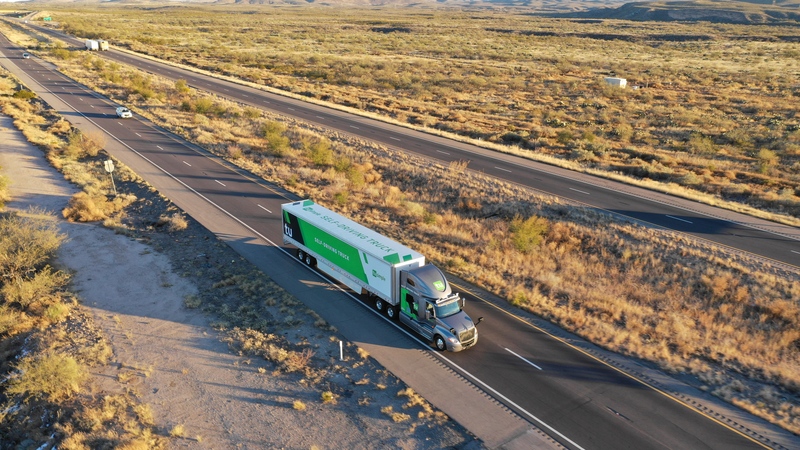 “Exactly one year after debuting our prototype system at CES 2018, we’re now running up to five commercial trips a day in Arizona, expanding our fleet and moving quickly toward our goal of creating the first commercial self-driving truck,” TuSimple founder, president and CTO Xiaodi Hou said. TuSimple, which is displaying a Navistar International LT semi-truck at CES, also announced that it’s working with Tier 1 supplier Cummins Inc.to enable powertrain integration with its autonomous technologies. TuSimple, which is backed by Nvidia and Sina, operator of China’s biggest microblogging site Weibo, is working on a “full-stack solution.” This wonky industry term means TuSimple is developing and bringing together all of the technological pieces required for autonomous driving. The startup is developing a Level 4 system, a designation by the SAE that means the vehicle takes over all of the driving in certain conditions. An important piece of TuSimple’s approach is its camera-centric perception solution. Much of the autonomous vehicle tech industry has focused on LiDAR to improve the perception of the vehicle, arguably one of the most difficult tasks of automated driving. But LiDAR has its limitations, especially for trucks traveling at speeds of 55 miles per hour and faster on highways. LiDAR can detect objects like cars to about 250 meters, although the optimal quality falters past 150 meters. TuSimple’s camera-based system has a vision range of 1,000 meters, the company says.